The last two weeks’ worth of national news has chronicled a surreal drama acted out in the Nevada desert. Cliven Bundy, a long-time rancher and the Bureau of Land Management, became embroiled in an armed standoff over the removal of the rancher’s cattle, which Bundy forfeited after twenty years worth of nonpayment on his grazing fees and a final court summary judgment. Right-wing pundits, wildlife activists, and a host of others have turned Bundy and the misery of his situation into anecdotal proof of the justness of their various ideologies. But Bundy is no ideologue, despite his language about protecting his rights and liberties. His adoption of politically charged rhetoric is a defense mechanism and not a real identity; just watching him stumble through the Sean Hannity interview on April 9th makes that abundantly clear. As Hannity works to contextualize Bundy’s experience within the framework of an overreaching federal government, the rancher has trouble staying on script. It is awful watching the news media objectify Cliven Bundy and there is no easy corrective to the situation. It may help, however, to know a little more about Bundy’s history and what he means when he says that his family has ranched in the area since the late nineteenth century. The Bundy family is actually not from Bunkerville, Nevada, the site of last week’s tense standoff and home to Bundy’s ranch. According to the NBC news affiliate in Las Vegas, the Bundy family applied to use the Bunkerville Allotment in 1954, when Cliven was 8 years old. Cliven’s father David Ammon Bundy had relocated the family to Nevada sometime after the 1940 census. This particular branch of the Bundy family has their roots in the Arizona Strip, a stretch of rugged land in the northern part of the state. In the late 1910s, Cliven’s great- grandfather Abraham Bundy, a bona fide Mormon pioneer, helped establish the Mount Trumbull community, a settlement also known as Bundyville, in a remote corner of Arizona just north of the Grand Canyon on the Shivwits Plateau. Abraham and his five sons, including Cliven’s grandfather Roy, filed homestead claims under the Stock-Raising Homestead Act (1916) there. Between 1925 and 1940, the family patented (brought into private ownership) close to 4,000 acres in the area and raised cattle. But the Bundy family did not survive the transformation of public lands from free land to organized grazing range under the Taylor Grazing Act (1934). Although they had adequate base property to be included in the process of grazing district organization, they may not have had the necessary water rights associated with their grazing range. In addition, their proximity to Grand Canyon National Park (1919) may have proved problematic as the nascent National Park Service (NPS) asserted control over its administration. The Bureau of Land Management has preserved some of the few buildings left in Mount Trumbull, including the one room schoolhouse, and the agency notes that by the late 1960s, the community had ceased to exist. The Bundys’ move to Bunkerville, Nevada, from Mount Trumbull, Arizona, was probably predicated on familial relationships. Mormon families in the area move seamlessly between St. George, Utah, the Arizona Strip, and eastern Nevada. The artificial boundaries state lines created are only politically relevant; culturally, economically, and environmentally, this area is fundamentally interconnected. The Bundy family purchased their 160-acre ranch in Bunkerville to make a fresh start, taking advantage of the opportunities southern Nevada offered in the 1950s. Along with the ranch, Bundy secured ground water rights through the Nevada State Engineer’s Office by partnering with his now-deceased neighbor Keith Allen Nay. Also a pioneer Mormon family, Nay’s father, Allen Herbert Nay, had homesteaded 160 acres prior grazing district organization and his grandfather, Ormus Calvin Nay, had helped settle the now submerged town of St. Thomas. Nevada water records indicate that the Nay family held the original water rights, all of which were used for stock watering purposes. The purchase of this base property along with the water rights is what allowed the BLM to permit the Bundys on the Bunkerville Allotment. These permits required annual fee payments and decennial renewal. By Nay’s death in November of 1997, he (or his son) and Cliven Bundy had vested (secured in perpetuity) their water rights at a dozen springs and were permitted to water at least 100 cattle at each and up to 250 at some. In the 1960s, when the Bundys made their first grazing permit renewal, public lands administration was undergoing a sea change that shifted the emphasis of public lands management from mining and livestock production to include outdoor recreation and ecological preservation under a multiple-use framework. Prompted by the popularity of outdoor recreation in particular, the Johnson administration approved creation of the Lake Mead National Recreation Area (LMNRA). The recreation area expanded the original Boulder Dam Recreation Area and by 1972 straddled BLM land, including some grazing ranges. The BLM managed these ranges, including the Bunkerville Allotment, under a cooperative agreement with NPS. This meant that the grazing range was subject to typical annual adjustments in cattle numbers and increases in grazing fees under BLM administration and pressures from the expanding national recreational demands and changing ecological preservation mandates faced by the NPS. By the late 1970s, The Bundy family’s ranching operations were no longer given priority status by the BLM. The 1976 Federal Land Policy Management Act officially retained all land not already in private or state ownership and required the BLM, an agency historically known to be sympathetic to ranchers, to manage all public lands using multiple-use. Known as the BLM’s Organic Act, it also required the agency to increase grazing fees and conduct environmental impact studies on allotments to better determine their viability for cattle production. This act sparked a public outcry in Nevada known as the Sagebrush Rebellion. A former Future Farmers of America officer, 30-year old Cliven Bundy became a sagebrush rebel, serving on the Nevada Land Action Committee and promoting legislation to transfer public lands to the states (Nevada State Journal, April 10, 1964 and December 1, 1976). Bundy supported state oversight of public lands as a way to alleviate the administration of his grazing range from the pressures of national interests. Federal retention of public lands ensured that they would be managed in the interests of the American people, but this subjected them to a wide variety of sometimes-conflicting uses and often required reductions in traditional uses. Bundy promoted state oversight because that potentially ensured he received continued priority, but the Sagebrush Rebellion legislation failed and the rancher became just one user among many. At 50 years old, Cliven Bundy must have feared the worst—losing the family ranch for the second time in two generations. Ranching in southern Nevada is marginal at best. The scarcity of water and forage and the delicate desert ecosystem make it difficult for both Bundy to raise cattle and for the BLM to accommodate multiple uses. At the minimal herd level he maintained in 1993, it is doubtful Bundy made much of a living off his herd and if his cattle operation ceased, only he and his family would suffer its loss. For Bundy and other small public lands ranchers, litigation is the last resort. In court cases beginning in 1998, he probably hoped his base property and vested water rights would anchor him on the grazing range, demonstrating his priority right to use it. He used the language of the Sagebrush Rebellion—focusing on Nevada’s “sovereignty” and his “freedoms”—because that was rhetoric he understood. What he has been trying to communicate is that he is frustrated with making continual accommodation to the interests and demands of multiple public land users—everyone from outdoor recreationalists and nature enthusiasts to wild horse advocates and wildlife biologists. He is tired of adapting and that has become his hubris, which is why he stopped paying his grazing fees in 1994, dug in his heels, and let his cattle proliferate to a ridiculous degree. The successive court cases have bought Bundy time, but have not changed his situation. If anything, the last court case in 2013 criminalized him for grazing the New Trespass Lands, those adjacent to the Bunkerville Allotment. 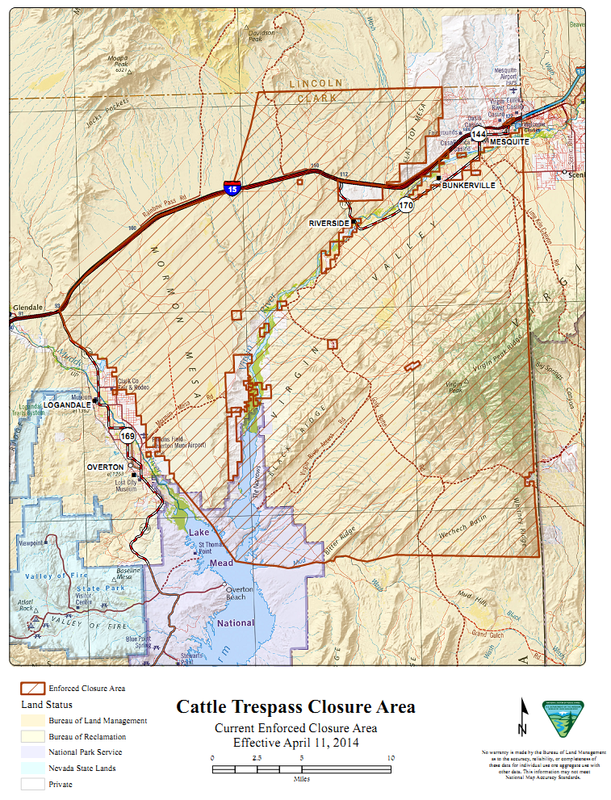 The entire area is closed to grazing now and the court has declared, “The public interest is best served by having the federal lands managed without the presence of trespassing cattle on lands that are closed to grazing” (United States v. Cliven Bundy, July 9, 2013). Bundy cannot pay the grazing fees or the penalties that have accumulated in the past two decades. Neither can he continue to ranch in Bunkerville. All that is left to Bundy is some semblance of his dignity, which is quickly being eroded on national television. In his late 60s now, the man is probably exhausted. He should not be made into the mascot or villain in anyone’s cause and we should not be so quick to condemn him. Rather, Cliven Bundy deserves a little bit of empathy since it is we who have asked him to continually adapt. Leisl, I wish I was as smart as you. Excellent piece. This reminds me though of a thought I have had for quite some time now–why does society seem to grant ranchers a free pass with respect to their livelihoods? (Note–this is not what I think you assert in your article). I have seen dozens of works that decry the loss of the ranching lifestyle, and that some sort of either government action or larger social mobilization should occur in order to allow western ranchers to continue their career. This almost never happens with any other livelihood. If a Las Vegas casino needs fewer dealers, they are laid off, same as when a school district has surplus teachers, and auto plant has too many laborers, so on, and so forth. Yet, we don’t see the same type of public outcry demanding something be done to allow dealers, teachers, and auto-laborers to continue their jobs, and Fox News certainly does not weigh in over the role of government. Furthermore, if any of those groups tried to assert a “heritage” argument, it’s likely they’d be me by a chorus of scoffs. As with the aforementioned livelihoods (dealers, teachers, and auto-laborers), demographic, economic, and/or social trends overtook them. In the case of teachers, sometimes a city simply loses population, thus necessitating a decrease in the educational workforce. These types of forces are larger than these jobs, and are something that simply has to be accepted for the most part. This same thing has occurred on the nation’s public lands. One thing that is totally downplayed in Cliven Bundy accounts, is that the BLM only acted AFTER it was sued by the Center for Biological Diversity. This was two decades after Bundy had stopped paying his grazing fees. So, it is rather ironic that so much anti-government ire is being directed to an agency that, as you stated in your article, has proven to be rather sympathetic to ranchers. The larger point is that the Center for Biological Diversity is merely one aspect of a growing level of public sentiment that demands we as a nation utilize out public lands in a different manner. Conservation is now preeminent within this ethos, and represents one of the larger shifts that can at times make previous livelihoods irrelevant or inconsistent with a newer era. We can all feel empathy for Cliven Bundy; We can, of course, also feel empathy for the thousand or so teachers that were laid off in Las Vegas over the past seven years. Both Bundy and teachers face and faced the prospect of the elimination of their job. But only one group is allowed by large elements of society to claim a culture and custom justification for their livelihood. As you point out, it is easy to manipulate this emotion to fit a specific ideological view over the role of government. While the Bundy case certainly has this, in reality, (and in addition to your conclusions), it simultaneously presents an example of how changing trends can overtake those who based their economic livelihoods on a previous paradigm, and also, how we as a nation remain utterly fascinated with the cowboy mystique. The premise of Christian Harrison’s complaint is overstated. I’ve heard enough urban environmentalists express disdain at the very existence of ranching, mining, and irrigation farming–think of the famous Toles cartoon from the 1990s complaining of the long tradition of “welfare” ranching, logging, and mining–to know that “society” gives no vocation a free pass. The people who do valorize ranchers and farmers–sometimes uncritically–have a point in saying that we really do need them in a way that we don’t need card dealers in Vegas. Whether we need ranchers on the Arizona Strip or Bunkerville Allotment is a much more contextualized discussion, but there’s slippage in your comment that we should guard against. Two things jump out at me from Leisl’s piece. First, Bundy has a colossally inconsistent relationship with the government. Setting aside his denial of federal authority while riding around waving an American flag, Bundy regularly renewed his federal grazing permits over the decades, a not so small detail I had not know before. The second was Bundy’s prominence in the Sagebrush episodes. I think Leisl overstates the case when she argues that “Bundy is no ideologue.” Cliven Bundy’s (and Sean Hannity’s) ideas may be inconsistent and undoubtedly confused, but there is certainly ideology driving him as well. Whether his army holds is a different matter. The piece in today’s NYT (http://www.nytimes.com/2014/04/24/us/politics/rancher-proudly-breaks-the-law-becoming-a-hero-in-the-west.html?emc=edit_th_20140424&nl=todaysheadlines&nlid=63415342) will not go well for Bundy. Rand Paul has gone to ground, and at least some of Bundy’s armed forces are likely to balk at Bundy’s theories about Black people and slavery. One final point about Leisl’s piece. I think we can romanticize Bundy’s attachment to the land a bit too much. The loss of two ranches in one century would be a wrenching dislocation, one I’m not about to diminish, but it seems to me equally important to point out that the loss of those grazing permits would also amount to a devastating diminishment of the capital value of the family improvements to the property. That is another part of the argument about “takings” that underscores how society can, through a redefinition of the value of land, materially as well as culturally diminish the value of the vocation of ranching. “Bundy is no ideologue” and yet he denies the existence of the U. S. government and claims that the BLM has no jurisdiction over public lands. He can’t even get his basic history right it’s so clouded with idealogy! The “pre-emption rights” he keeps claiming to have were in fact only derived from authorities vested in the BLM’s predecessor agency, the U. S. General Land Office. The GLO was founded in 1812 and its authority to dispose of the public domain came from the very Constitution Bundy professes to revere. Bundy states his preemption rights came from the the state and yet the state never managed the public lands; he tried to pay his grazing fees to Clark County and it returned the check because it does not have jurisdiction. The GLO stopped recognizing preemption claims in the 1890s and for good reason: they were being abused by squatters. Some things don’t change. Reading stuff like this just makes me realize just how much there is to these stories we (people who don’t pour over the details like this) don’t know. Great job. I study radicalization and conflict in other contexts, but have long understood that the core dynamics of these processes aren’t cultural, they’re psycho-social. That is, it’s not Islam, or Christianity, or Communism, or any other specific theology or ideology that makes one radical, one becomes radical through a psycho-social process. What you’ve laid out is a classic “recipe” for the process. Thanks for the article. I enjoyed this article as it helps me understand the events of 2016. After almost two years this may be the best single piece I have read on this whole affair. A sincere attempt at genuine objectivity is so rare today that when I read this it sorta took my breath away. Thank you for materially expanding my perspective on Mr. Bundy and the whole issue. And congratulations on an excellent piece of writing! Pingback: What Happens Now That the Bundy Trial is Over?